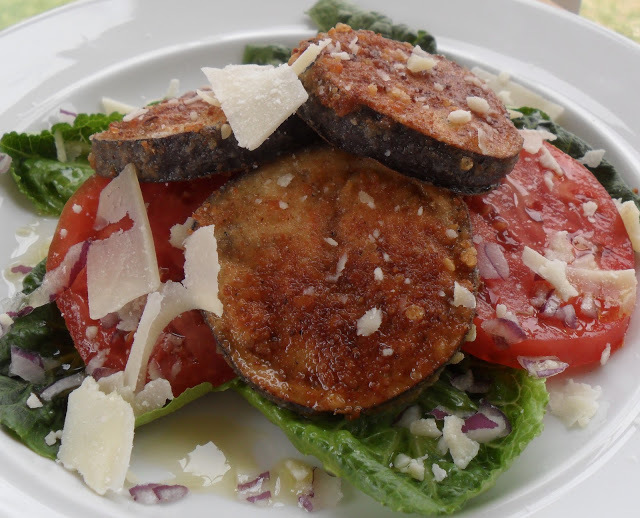 What can you do with Eggplant, Tomatoes, Lettuce & Olive Oil? You can fry the eggplant and create an incredible salad. About a week ago, I caught an episode of The Real Housewives Of Miami. On this episode the ladies met up for a cooking lesson and an argument about a charity event. Do the words “argument” and “charity event” ever belong in the same sentence?! Anyway, in the cooking lesson they learned to fry eggplant and to stack it with rounds of tomato and mozzarella cheese. 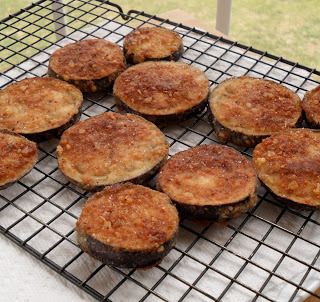 Simply slice eggplant, dip in beaten egg white, then dredge in cheese/breadcrumb/flour mixture and you’re ready to fry. Add a smashed clove of garlic to season the cooking oil…Yummy! To keep crispy, transfer to a wire rack set atop a paper towel lined plate. 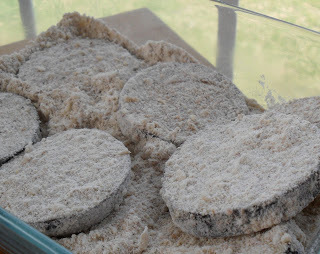 In a shallow dish mix Parmesan, bread crumbs, and flour. Cut eggplant in 1/4 inch slices and place in egg white mixture. Dredge in cheese/crumb mixture. Heat a small amount of oil(1/4 inch) in a heavy skillet along with smashed garlic. 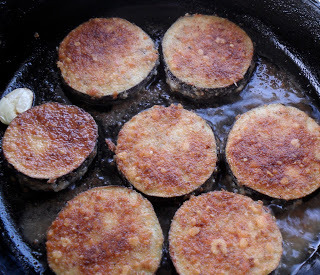 When oil is hot, pan fry the breaded eggplant for 3 minutes on one side, then 2 minutes on the 2nd side. Transfer to a wire rack atop a paper towel lined plate. Plate salad greens, top with tomato and fried eggplant. Sprinkle with Parmesan cheese and red onion. Drizzle with olive oil. Salt & Pepper to taste. Sigh, as a native Miamian those women make me cringe–not because it’s an incorrect portrayal of the Miami Beach lifestyle, but because IT IS. Ech. Your delicious looking salad however, is not Ech. It looks scrumptious! I’m all for having a little something fried in my salads. thanks so much!!! I’ll always be a lemonhead cant get enough. my mom adores eggplant so I’ll have to try this for her sometime!